Ayupp Analysis – The information given in the viral message being spread is half true. 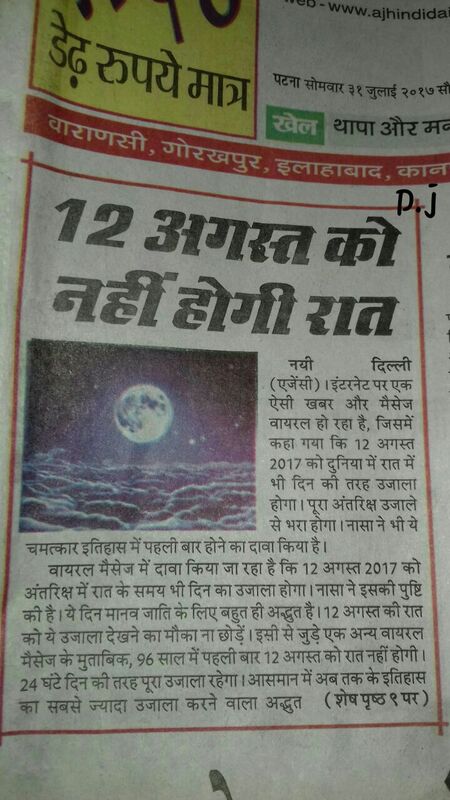 Though the there will be meteor shower on Aug 12, 2017. The peak of the Perseid Meteor Shower is coming in just a few weeks! According to NASA meteor expert Bill Cooke, the Perseids are perhaps the most popular meteor shower of the year. Typical rates are about 80 meteors an hour, but in outburst years (such as in 2016) the rate can be between 150-200 meteors an hour. The meteor shower's actual peak is around 1 p.m. EDT Aug. 12, which means that the night before and the night after will both have good rates; Cooke said the show would be slightly better in the predawn hours of Aug. 12, but that there'd be a decent show both nights. The Perseid meteor shower is among the strongest and most well-known. Perseids are active from July 13 through Aug. 26, peaking the night of Aug. 12 into the following morning. The meteors visible during this shower are remnants of comet 109P/Swift-Tuttle during its many trips through our part of the solar system. Because the Earth passes through different streams of debris left by the parent comet or asteroid, meteor showers do vary in intensity from year to year. However, there is no expectation that this year’s Perseids will be particularly bright or numerous. Bill Cooke of NASA’s Meteoroid Environment Office at the Marshall Spaceflight Center confirmed this morning that no outburst of activity is expected this year. The office estimates that 80-100 meteors will be visible per hour under optimal viewing conditions away from light pollution remain—about the same estimate in the past. The intensity of a meteor shower is difficult to predict, though. While we know which debris stream Earth will be passing through, and historical records of past meteor showers can give us an idea of how many meteors we might see and how bright they might be, those streams are constantly being pulled and pushed by the gravity of the Sun, Jupiter and the rest of the solar system. We just can't predict with the confidence displayed in these claims. Look for more about the Perseid meteor shower here in the Weather Blog closer to the peak.